1.Heat oil in a heavy bottomed pan add mustard seeds, let them crackle. 2.Add curry leaves and grated ginger, sauté till the raw aroma of ginger disappears. 3.Now add finely chopped onion, sauté till translucent, add green chillies, sauté for 02 minutes. 4.Now add the lightly roasted semolina, add the green peas, sauté for 02 minutes add the hot water. 5.Add the salt to taste. Stir, to prevent lump formation. 6.Now cover it and cook on a very slow fame. Cook till all the water is absorbed and semolina and green peas are cooked. 7.Serve hot garnished with Chopped Coriander leaves or grated fresh coconut. Always dry roast the semolina and keep it in an air tight container, not only to save time but also to prevent worms. 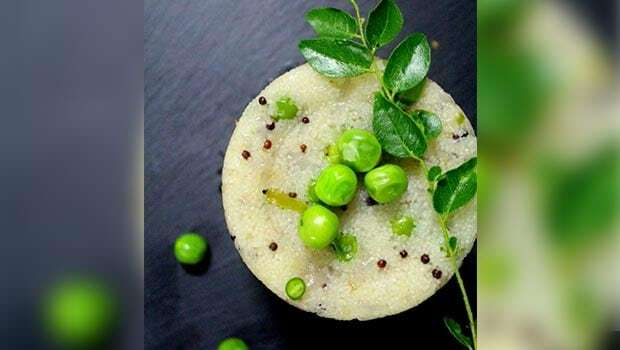 To save time you can separately boil green peas in 2 cups of water add salt to it, taste for proper salt add more if required and add this water + Green peas + Salt to the prepared sautéed semolina mixture.